Boxing-the-wake manuevers: Lousy. It got pretty bumpy over the ridge, but I won't hide behind that excuse again. Crosswind landings: Subpar. 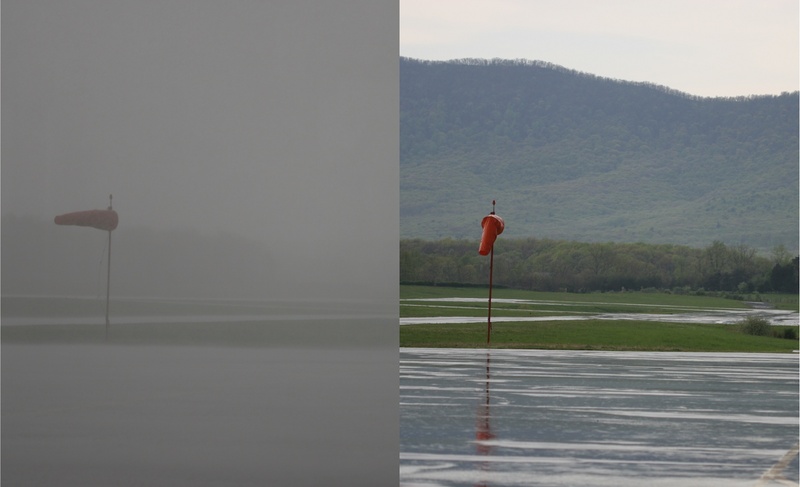 Winds were out of the south (nearly direct crosswind from the left). It got squirrelly below the tree line, and I didn't sort that out quickly enough before the instructor intervened. The weather on Sunday, 24 April was interesting. In the afternoon, the duty officer spotted a storm cell on the RADAR and called all hands to put the gliders away. 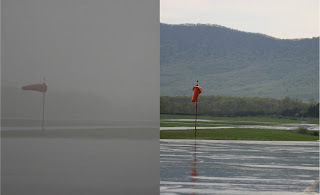 A few minutes after the last sailplane came to rest safely in the hangar, the precipitation rolled over the ridge and drenched the airport. About ten minutes later, the sun was shining again. I managed to get in two tows to 3,000 feet and called it a day well before the storm rolled through. With the Grob 103 pointed directly into the wind, I noticed the airspeed indicator reading 20 knots during the gusts, so it was probably for the best. I was disappointed with my performance. I've done much better in prior lessons. To put that statement in perspective, though, I am grateful just to have had the opportunity to get airborne; there is really no such thing as a bad day flying. On a good note, the airspeed indicator remained covered for most of the two flights, and the instructor said that I was holding the airspeed within 2 knots of the requested 45 knots. My coordination wasn't good. The Grob requires way more rudder input than the "K" and, initially, I wasn't giving it enough. I'd only flown this ship a couple of times before. I had the opposite problem in the "K" a few weeks ago, where I had a tendency to skid--too much rudder. I made a concerted effort to keep the yaw string straight. On the upwind legs, I was chasing the string a bit with the rudder through the gusts. I also chased it on a few of the steep turn entries, using a little bit of opposite rudder to fix a case where I used too much on the entry of the turn. The instructor's evaluation ripped me for that. I'll be ready to give it hell when I can fly again in a couple of weeks. In the meantime, I found a used copy of Kern's Redefining Airmanship that I am anxious to begin reading. Laissez les bon temps rouler!